There is a great deal to like about InMotion Hosting. Their cheapest shared hosting plan, Launch, retails for $6.99 per month for the initial 1-year term and renews at $8.99. Except for ecommerce functionality, it includes everything you need to set up a personal or business website. 2016 update: We retested InMotion with a series of uptime and speed tests and it was stable from day one, websites stayed up all the time during tests and performance was one of the best across all other hosting companies! Looks really good and solid. InMotion Hosting remains a very good hosting provider and has earned the NCM Online designation of HIGHLY RECOMMENDED. InMotion Hosting offers three affordable shared hosting plans: Launch, Power, and Pro. All three include unlimited disk space, bandwidth, and e-mail accounts. The main difference lies in the number of websites, MySQL databases, subdomains, and parked domains permitted on each account. Also included with InMotion shared plans are free website transfers, free data backups, and a free domain name. All three plans are backed by a 90(! )-day money-back guarantee, 24/7/365 US-based phone, chat and e-mail support as well as an A+ BBB rating. As is our practice, we selected the lowest-cost plan (Launch) for reviewing and testing purposes. It should be noted that one drawback of the Launch plan is that unlike the Power and Pro plans, it is not ecommerce compatible. If you intend to build an online store, you will need to choose either of the higher-priced ecommerce-ready shared plans. While the InMotion checkout process consists of 4 steps, it is quick, easy, and straightforward. InMotion does not try to trick you into transferring your domain name away from your current registrar, nor do they automatically add unwanted options into the shopping cart as some web hosting companies do. The Launch 1-year term plan costs $6.99 per month for the first year and renews at $8.99 per month for the second and subsequent years. InMotion AMP (Account Management Panel). Click to enlarge. As InMotion Hosting does not offer a PayPal payment option, we completed our purchase using a credit card. The “Welcome” e-mail arrived in our inbox approximately 20 minutes later. While it did not provide the nameserver (DNS) settings, FTP login, or e-mail settings, it did include a link to the Account Management Panel (AMP). See screenshot right. From the easy-to-use Account Management Panel we were able to access the popular, fully-featured and newbie-friendly cPanel control panel. See screenshot below right. Once inside cPanel, we were able to set upload our NCM Test Site quickly using the built-in file manager. 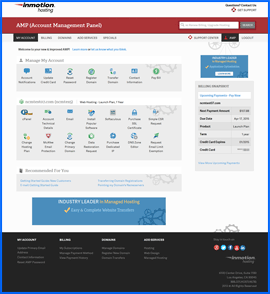 Note that the nameserver settings cannot be found in the cPanel control, but in the AMP (Account Management Panel). You can access them by clicking the “Account Technical Details” icon. InMotion Hosting provides the user-friendly Softaculous 1-click script installer for installing WordPress, Joomla, Drupal, phpBB, MediaWiki, Moodle, or any of the numerous CMS (content management systems) and applications included in the extensive and expertly categorized script library. Softaculous makes it easy to add advanced features like polls, surveys, games, calendars, guestbooks, image galleries, and more to your website. 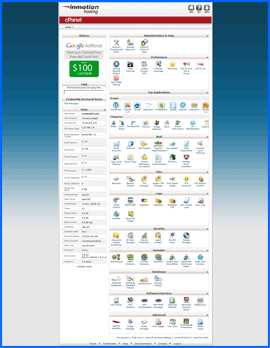 InMotion cPanel control panel. Click to enlarge. Having uploaded our simple 1-page test site, we next set up Dotcom Monitor testing. All web hosting services reviewed by NCM Online are purchased and subjected to our 10-day test for uptime and page-load speed. 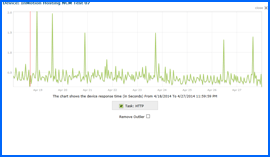 Beginning on 4/18/14 and concluding on 4/27/14, our InMotion hosted website was checked for page-load speed and uptime every 15 minutes. In all, the testing consisted of nearly 2000 individual checks spread across 13 worldwide locations. Unfortunately, our test site began experiencing uptime problems on 4/18/14 — the very first day of testing. At 4:22 PM EST, the server began refusing attempts to access our site from 10 of 13 test locations (Hong Kong, Frankfurt, Amsterdam, London, Montreal, New York, Florida, Minnesota, Colorado and California). The problem continued for slightly more than 30 minutes. In all there were 14 failed attempts, all returning 403 Forbidden errors (the request was a legal request, but the server is refusing to respond to it). While our testing continued and concluded without a single additional error, the damage had been done. Not only did the server issue lower InMotion’s overall uptime percentage to 99.7869, but it ruined what were otherwise the fastest page-load speeds we have recorded to date. 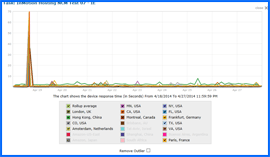 See uptime and speed test charts below right. InMotion Uptime Test Results Chart. Click to enlarge. Consider this. InMotion averaged a 1.9226 seconds to load our test page from the 13 worldwide locations, and an equally disappointing 1.6774 seconds to load our teat page from the 7 US locations. However, had testing begun on 4/19 instead of 4/18, InMotion would have averaged only 1.0025 seconds to load the test page from the same 13 worldwide locations, and only 0.7521 seconds from the 7 US locations. Had we excluded the problematic first day and limited testing to 9 days, InMotion Hosting would be without question, the fastest shared hosting service we have reviewed to date. However, we cannot in good conscience make exceptions for bad server days. InMotion Speed Test Results Chart. Click to enlarge. “Welcome” e-mail does not nameservers, FTP login info, e-mail settings, etc. Despite its unfortunate initial uptime issues during testing — issues that ruined otherwise stellar speed test averages — we found InMotion Hosting to be a good shared web host that warrants your consideration. InMotion Hosting has earned 4 stars and is recommended with reservations by NCM Online. Cheap website hosting company price comparisons based on 1-year term list price before coupon/promo codes or limited time/introductory offer discounts. These are the renewal rates for the second year of hosting. To ensure that you receive the most affordable InMotion pricing possible, please visit our Web Hosting Coupon Codes page for current discounts and special offers before making any purchases. InMotion Hosting offers a varied selection of web-hosting accounts so it can meet the needs of different sized clients. There are three levels of web-hosting plans — Launch, Power and Pro, with Power being the most popular. Each plan comes with a free domain name registration — either new or transferred, unlimited GB of disk space, data back-up, a 90-day money-back guarantee, free SPAM SafeTM email with IMAP, free no down-time website transfers, 24/7 support, 99% uptime, and premium website builder software. The Launch Plan comes with two websites, two MYSQL databases, $275 in advertising credits, 6 parked domains, and 25 subdomains. The Power Plan comes with six websites, 50 MYSQL databases, $300 in advertising credits, 26 parked domains, 100 subdomains, and e-commerce ready software. The Pro Plan comes with the ability to host 25 websites, 200 MYSQL databases, $300 in advertising credits, unlimited parked domains and subdomains, and e-commerce ready software. InMotion’s hosting network is supported by fast and dependable Unix and Linux systems. The network has 24/7 monitoring for unusual activity and is continuously checked for performance. This monitoring enables immediate response to system issues and allows for optimal system growth — keeping the system continually broadband ready, cost-effective and fully redundant. As a result the company can offer web hosting that outperforms that of their competitors in dependability, speed and cost. InMotion is also the sole web-hosting company that offers Max Speed Zones. InMotion Hosting maintains first-rate hardware, but the company’s people are its true source of innovation. The management team consists of technology experts who on average have over 10 years of expertise in web hosting. The members of its expert web-hosting team have an average of four years of relevant professional experience. Each member of the support staff goes through a rigorous company training program. Support associates can only engage in customer support through chat, phone or email after they have completed a minimum of 160 hours of training. The company’s staff always takes the time to completely respond to customer questions 24/7. They have collected top-quality information for the construction, maintenance and growth of websites on the company’s center for Web Hosting Support. The firm’s personnel have business and technology backgrounds and they are always seeking new hardware, software, and methods to improve their existing tools. It’s a matter of pride and not just business to the firm’s experienced staff. InMotion also takes suggestions from clients and has utilized some of these suggestions to add functionality to its servers. The company has data centers on both coasts that are fully redundant (N+1) and climate controlled so that can provide its clients with the reliability they desire. InMotion Hosting recently improved and expanded both data centers. These improvements included upgrades to the company’s own carrier level platforms, as well as assisting with its business partners’ improvements, all in order to better meet customer needs. InMotion always maintains four Tier 1 ISP providers — so that they have multiple backups to maintain data flow even in the case of catastrophic events. The firm also has upgraded to carrier grade routers to ensure maximum efficiency. The firm’s data centers have hand scanners, locked vaults and armed guards so it can achieve the highest level of data security. In addition to being one of the country’s most rapidly growing website hosting providers, InMotion is committed to eco-friendly policies. Since 2010, the company has engaged in concentrated efforts to reduce the carbon footprint of its data centers. It has also initiated green policies in its offices in order to increase recycling, lessen waste, and prevent paper product use whenever possible. InMotion believes that it’s better to reduce energy use rather than to offset it. The large data centers that are needed by all web hosting companies consume enormous quantities of energy. More than half of the energy consumed by these centers is needed for cooling and air conditioning. In order to cut its energy use, InMotion opened the first Green Data Center in Los Angeles, CA. The center utilizes cutting-edge Outside Air Cooling technology, which has reduced cooling expenses by almost 70% and carbon output by over 2,000 tons annually. InMotion stands by its claims and invites clients to try out its service offerings without obligation. The company provides a 90-day money back guarantee because it truly wants all of its customers to be content with its web hosting services. This video tutorial will show you exactly how to install WordPress on your InMotion Hosting shared account using the Account Management Panel (AMP) and the Softaculous script installer.